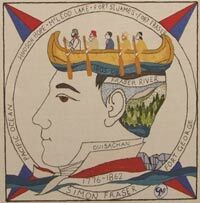 Embroiderers' Association of Canada, Inc.: Scottish Diaspora Tapestry in Victoria Now! The panels are at Christ Church Cathedral from May 13 to 30, 2016. The exhibit is open from 10 a.m. to 4:00 p.m., Monday to Saturday. The cathedral is in downtown Victoria, Quadra St. at Rockland Ave. Find out more about this exhibit on the Christ Church Cathedral website. Be sure to check out the Cathedral's Facebook page for a fantastic photo (at the top of the page) of the panels. In the GTA, the exhibit will be from September 19, to October 1, 2016, at St. Andrew's Presbyterian Church, 115 St. Andrew's Road, Scarborough, ON.